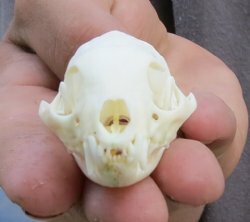 We carry real African cape gray mongoose skulls and real yellow mongoose skulls. These mongoose skulls were imported from South Africa. They have been cleaned and are ready for display. The Cape gray mongoose, Galerella pulverulenta, also called the small gray mongoose, is a mongoose endemic to southern Africa. The yellow mongoose Cynictis penicillata, sometimes referred to as the red meerkat, is a small mammal averaging about 1 lb (1/2 kg) in weight and about 20 in (500 mm) in length. A member of the mongoose family, it lives in open country, from semi-desert scrubland to grasslands in Angola, Botswana, South Africa, Namibia, and Zimbabwe.